Project lead Dr Frauke Behrendt successfully applied with Dr Anne Mandy for Department for Transport/Carplus funding (£35,464) for the ‘University Campus e-bikes’ project in Eastbourne. This project is an example for the impact of the ‘smart e-bike’ research findings. The opening was supported by Transport Minister Andrew Jones, with Shane Snow and John Sweeetman from the Department for Transport, alongside Eastbourne MP Caroline Ansel and Mayor Councillor Janet Coles, as well as the University of Brighton’s Vice-Chancellor, Professor Debra Humphris. “Transport Minister Andrew Jones said: “Electric bikes are a great way to encourage new people to get into cycling and I hope this interesting scheme encourages more people to take it up. 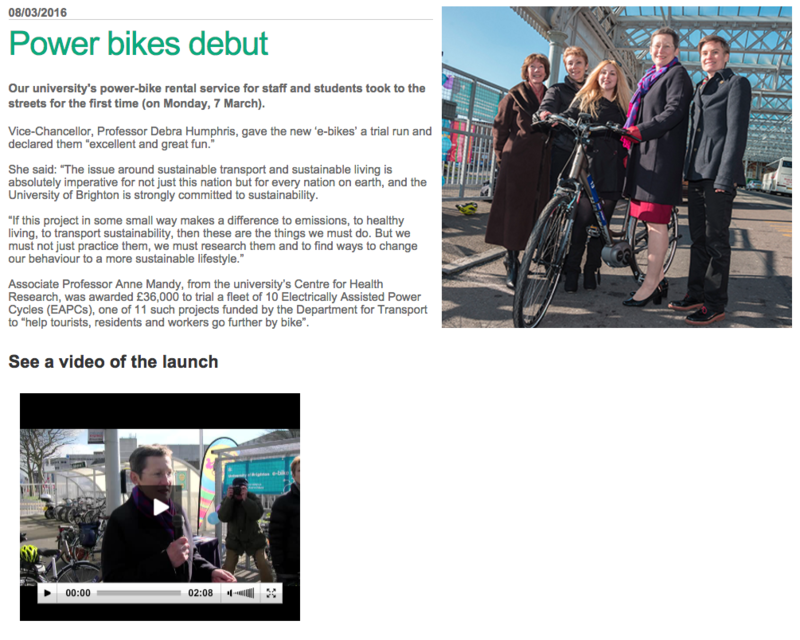 Cycling helps cut congestion and is a healthy, affordable transport option.” (Press release). Read all the other comments and watch the launch video on the university website.